That bridge wasn't even done yet. I wouldn't want to be a trucker right now. That's the only road connecting Canada. Wonder if that impacts the twinning being done on the highway (that caused the bridge to be built in the first place). It's going to be a major disruption. There's a fair amount of vehicle and truck traffic that can't use the detour through the U.S, either because they lack proper documents or because their vehicles aren't legal in the U.S. There will likely be a considerable uptick in traffic on M-28 and US-2 for the next few weeks, as well as the International Bridge in Sault Ste. Marie. It won't be an amount that should cause congestion; Canadian traffic is not uncommon on those routes even with Hwy 17 open. Some folks on Skyscraperpage forum had some good sense of humor about it. The bridge may be open to one lane, but the temporary fix isn't exactly confidence-inspiring: Crews simply loaded down the heaving side of the bridge with Jersey barriers to make it sag back down. Who could have known Ontario gets cold in the winter! We've already discovered that Alaska reaches -80 degrees Fahrenheit. That's -62.2 degrees Celsius. Pretty sure that Ontario can get that cold. and decided that 32 F was the coldest they needed to prepare for. CA means Canada, right? This solution only makes sense if the bridge was analyzed by structural engineers overnight and they confirmed that the bridge itself is sound, just not seated properly on the bearing. Something tying the bridge down snapped on the west end to allow the bridge to pull up. It's amazing that the bridge held together enough not to accordion toward the center pier and destroy itself - the deck is strong, but there's enough tension in the cables to break it. Glad it's partially back open. The alternative route around Lake Nipigon is a whole lot of fun! Pretty sure this is Ontario CA (California). The province of Ontario is too big for one chart to accurately show the weather across the province. It could be a hot summer day in Toronto and still quite cold in the far north. I guess I really do need to add sarcasm tags. Looks like upwards of 100 Jersey Barriers there, not exactly giving me a warm fuzzy feeling about either the bridge or the temporary fix. I'm aware of that suspension bridge in Indonesia that was asymmetrically loaded during some suspension hanger work and collapsed (several causes for that, BTW) but I'm not too familiar with cable stayed spans and their response to asymmetrical loading. Presumably they know what they're doing, but the same could have been said about the Indonesian collapse too . . . There are more details from the Toronto Sun here. 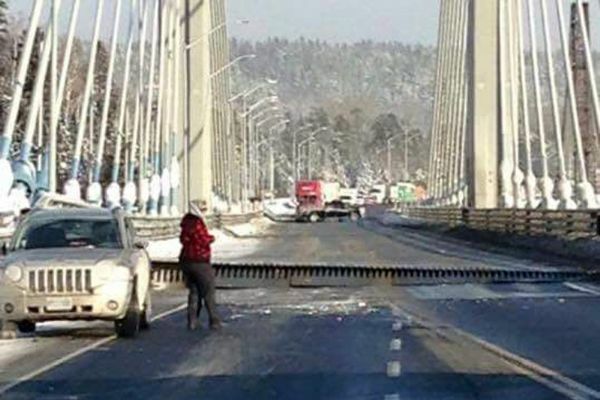 Sources say municipal politicians in northern Ontario have long been concerned about the material used for the bridge. 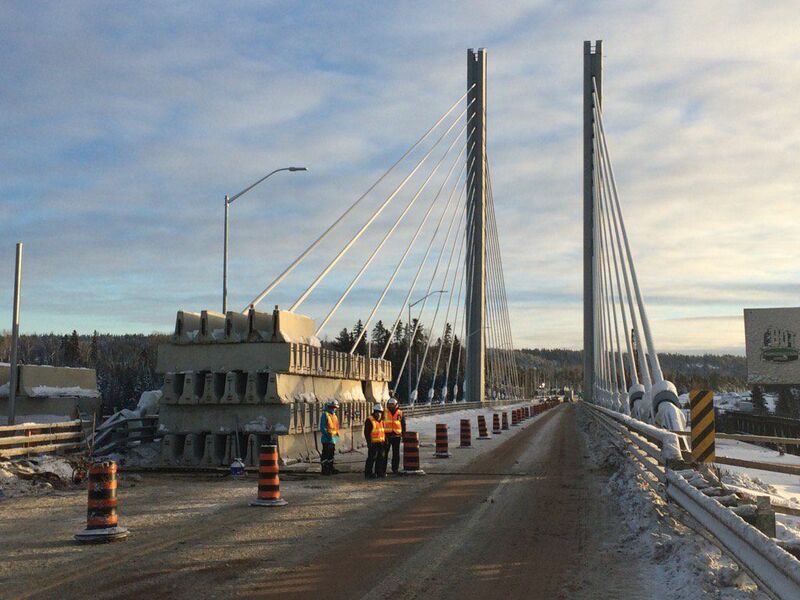 According to a PowerPoint presentation on the Ontario Good Roads Association website, while the pre-cast deck, towers and structural steel were all sourced in Canada, the cables came from Spain and the expansion joints were manufactured in China. A spokesman for the Ministry of Transportation says broken bolts were at fault. “Uplift occurred at the northwest corner of the structure due to broken bolts at a bearing connection. Our engineers are on site and continue to investigate. At this point, it’s too soon to say if cold weather was a factor,” adds Annemarie Piscopo. As a civil engineering student, it will be interesting to know what happened (even though I'm going into transportation engineering). Many factors could have contributed to this, though the cold is a likely source. *There are more details in a xenophobic and politically motivated article full of supposition and speculation, quoting an organization with a vested interest in the issue. The location of the consultant's head office is irrelevant. The specs will be laid out by MTO and Ontario Provincial Standards, which any engineer worth his or her degree can understand and design to. If they failed to meet them they will be held liable for the repairs. And additionally, this is a company with years of experience with 407ETR. Cold weather is not exactly a new concept to them. If someone changed a spec without the head office knowing. Like that walkway collapse where they took one threaded rod that was meant to support the weight of two platforms into a design that required a bolt to hold the weight of two since they replaced it with two rods, one attached to the upper platform instead of the straight down one. "Them Duke boys better grow some wings. Or start flappin' their arms." The page above has a diagram showing the "hold down support system" which is described as "temporary repair" to the bridge. That strikes me as unnecessarily risky. It seems to be that, at least in most cases (and certainly not in the middle of Ontario), there should always be some sort of readily available domestic alternate route. Are there any other choke points like this on the Canadian national highway system? Other than the section between Nipigon and Thunder Bay, the only other one I can think of is between MB 44 and ON 17A in eastern Manitoba / Northwestern Ontario. The only numbered road currently that crosses the provincial line is the Trans-Canada. It's in the planning stages to be twinned there, but for now, that's it. That's certainly the only road suitable for truck traffic. I think that's the only other point. Other parts of the country have the Trans-Canada Highway freeway, and have alternate routes. It just depends on where in the country it is.